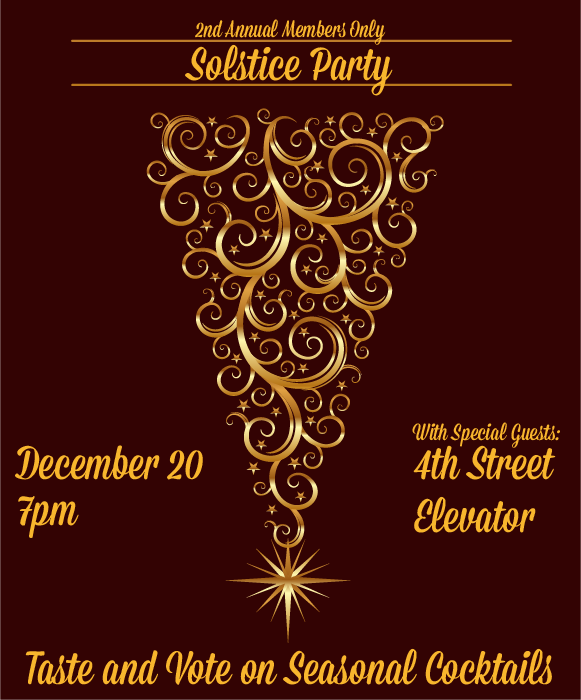 Please join us for our Member-Only Solstice Party! If you arrive early we’ll have pizza samples from Milwaukee Pizza Company. From 7-9 we’ll have free samples of seasonal cocktails. Members will vote on which drinks they want on the Winter Seasonal Cocktail List. And there will be live music from 4th Street Elevator. Come meet your fellow Public House Co-op members, drink, and be merry! Please note: this is for co-op members only. If you’re not a member yet or if your membership has expired, you are welcome to buy or renew a membership at the door. $40 for an annual membership or $200 for a lifetime membership.